Hello everyone and welcome back to my blog! Long time no see… Well I’m back, better than ever and super excited to be blogging again. I’m going to be uploading every Monday and Thursday over here at rubyredr0ses. Follow me on bloglovin to see my posts twice a week when I upload! I hope you all had a wonderful Christmas and New Year, I hope 2016 is being good to you so far! Are you sticking to your New Year’s resolutions? Today I’ve got my January favourites for you, these are one of my favourite blogposts to make and to read, I hope you enjoy this months! Naked Palette – This month, I have been loving Urban Decay’s original palette for two of it’s matte shades, naked and buck. I had delved out from using my Maybelline brow satin eyebrow pencil to using a Real Techniques detailer brush accompanied by a mixture of these two shades. The colour is perfect for me and I think it gives a bold brow without looking too overdone. This combination has made my brows easier and quicker to do than I could have ever imagined possible. Hoola Bronzer – Hoola is one of Benefit’s best selling products which I couldn’t understand why for a very long time. I received this in August as a birthday present and it has been sitting in my makeup collection gathering dust ever since. With the saying “new year new me” being on the tip of everybody’s tongues, I gave hoola a second chance and was pleasantly surprised. I’ve been wearing it pretty much everyday that I’ve worn makeup this year and I think it gives my skin a very flawless, tanned appearance. When my skin is tanned in the hotter months, I think I will find this easier to wear than on my pale winter skin. Eyes to Mesmerise; Veruschka – I could spend hours drooling over Charlotte Tilbury, the products are spoken so highly of and the packaging is simply stunning. This deep khaki cream eyeshadow was my first ever purchase from Charlotte Tilbury, and let me tell you, I am not disappointed. Rather the opposite, I can’t wait until I can justify it to myself to buy another product, possibly the feline flick panther or the filmstar bronze and go. Aside from the gorgeous packaging; this eyeshadow is a wearable shade, is extremely blendable and acts as a great base to add different eyeshadow on top. My favourite go-to eye look entailing veruschka is using it as a base then adding Stila copper eyeshadow in the middle of the lid with Mac coppering in the outer v and crease. Maybelline Master Precise Liquid Eyeliner – I used to be absolutely hopeless at eyeliner but after discovering felt tip eyeliners, the game has changed. I’m definitely by no means great at eyeliner but I can cobble together a look where both wings look remotely similar which is a skill I was lacking in before. When my previous eyeliner dried up I decided to try out a different drugstore eyeliner. This eyeliner is amazing, it is an intense black colour and stays put all day. Benefit Porefessional – I’m a keen advocate of using primers as my skin either consumes up my makeup or it slip and slides off my face. I apply the porefessional to areas where my makeup disappears first; generally speaking my nose, forehead and chin. This makes the pores on my nose decrease, my skin look smoother therefore my makeup glides on top and doesn’t seep into the nooks. It can be hard to tell whether a product prolongs the wear of your makeup but I really think this particular product does. I am currently using a mini version of the porefessional but I am definitely going to repurchase the full size version when I run out. applying it I often find myself sniffing my arms as it just smells incredible! Honey and Beeswax Natural Lip Balm – My lips get incredibly dry at this time of year, they crack all over and cause me a lot of discomfort. I use the hemp lip protector by the body shop religiously all year round but even that doesn’t seem to cure my lips when the weather is bitter. Another stocking filler was this lip balm from Chain Bridge Honey Farm, this is a local business to me and I already am head over heels in love with their Tweedside comb honey. I slather this on when my lips are particularly bad, usually before bed and when I wake up it’s like I have brand new lips. Tropicana Trop 50 Orange Juice – Seeing as January is the month where the vast majority of the population are trying to eat healthier and shift a few pounds, I thought I’d share with you one of my favourite healthier food swaps. Orange juice is my go to drink in the morning to have with my breakfast alongside my cup of lady grey tea. Normal orange juice is packed full of sugar and calories, not really the best thing to be consumed early on in the morning. I’m not sure if this lower sugar and lower calories version is a new launch from Tropicana but it’s the first I’ve seen of it in my local supermarket. Essentially without the ramble, this is a healthier version of the traditional orange juice, that in my opinion tastes virtually the same! Propercorn Sweet and Salty – For as long as I can remember I have always been a sweet popcorn kind of gal. Recently, I spotted this at a food hall and was so intrigued by the flavour and lower calories, that I bought a bag. The next day I went back and stocked up on two more bags, I’m sure you can gather my opinion on it from that gesture. The heartwarming story behind the popcorn had me hooked alongside the weird but marvellous array of flavours, from fiery Worcester sauce and sun dried tomato to sweet coconut and vanilla, there’s a flavour for everyone! Sweet and salty for me is the perfect balance of the two opposites flavours with beautiful almost caramel tasting popcorn. I think the very best thing about this popcorn is there are none of those rock hard kernels that you nearly break your teeth on at the bottom of the bag. This popcorn is my perfect healthier alternative of a sweet treat and I can’t wait to start exploring some of the other flavours. Isla and the Happily Ever After – This is my favourite book of all times, from the first chapter I was completely and utterly hooked. I can usually refrain myself from reading a book all at once, so I can enjoy it over time, but this one was an exception. The main character is a girl called Isla, who is head over heels in love with a boy called Josh, who she has liked since their freshman year. They both attend an American boarding school in Paris and go back to their families in Manhattan over the holidays. The story entails so many amazing characters; there’s Kurt, Isla’s lifelong best friend and Hattie, Isla’s younger sister. 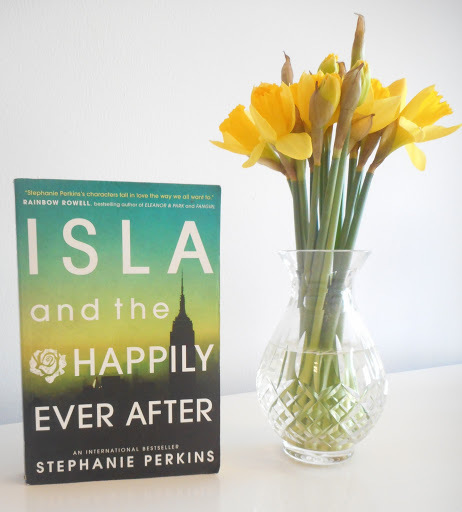 The connection I felt with all the characters in this book was immense and that is purely because of the excellent writing style of Stephanie Perkins. Romance has never been my genre of choice, but this book captivated my heart and soul, therefore I can’t wait to read the other two books in the series! 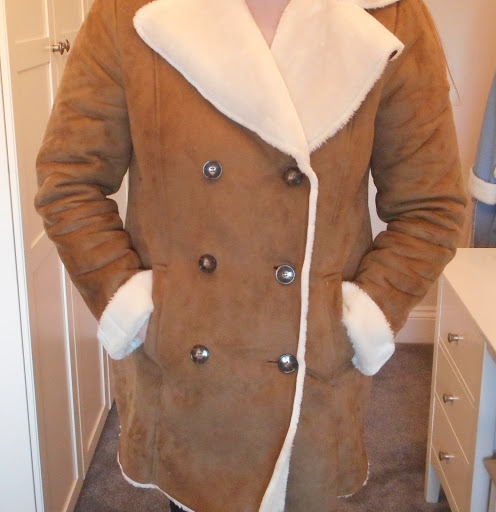 New Look Tan Suedette Double Breasted Coat – Probably my favourite item of the entire month has to be this beautiful coat. Previous to Christmas I was eyeing this up, so when it was in the sale for half of the original price, you could imagine how delighted I was. 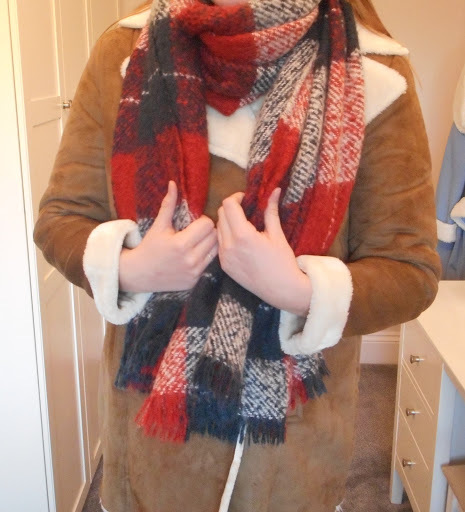 My wardrobe lacks dress coats so this fits the bill perfectly, it looks very stylish and surprisingly fits me perfectly considering I am very apprehensive on sizing when I buy online. Considering the original price was already pretty affordable, this jacket looks very expensive in my eyes and I am extremely happy I purchased it. Hollister Plaid Blanket Scarf – I have been on the hunt for a really soft and cosy scarf that I can wrap myself up in since last winter but nothing was ever just right. Whilst sale shopping after Christmas I stumbled upon this, yes, stumbled because you can never see anything in Hollister. I fell in love with it even more after trying it on and knew definitely that I wanted to add this to my winter wardrobe. I was pretty gutted when I got to the till and discovered it wasn’t in the sale like it said it was, however, I loved it so much I purchased it full price. It’s now in the sale for £6.99 from £19 so I would definitely recommend checking it out as it’s such a bargain and a firm staple piece in my wardrobe. Thanks for reading, I know this was a long post, but I’ve fallen in love with so many items this month that I was dying to share with you. Let me know down in the comments if you made it to the end, haha! Chapter 1 of 12 complete.